In response to a number of requests from a variety of learners and practitioners, the creative folks at Sim*Vivo have a developed a new learning system that focuses on the skills required to repair and anastamose bowel. 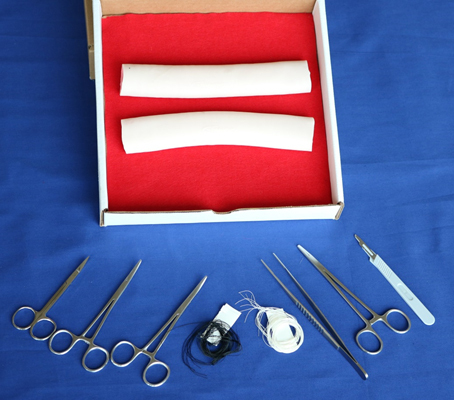 By attaching two of our very realistic bowel segments to a training board and then adding all of the instruments and suture required to perform multiple bowel procedures, this new learning system provides all of the materials to learn and practice enterotomy closure as well as end-to-end and side to side anastomosis. The included guidebook not only details the different type of suturing maneuvers that are required but also provides professional illustrations of each of the steps required for two layer procedures. 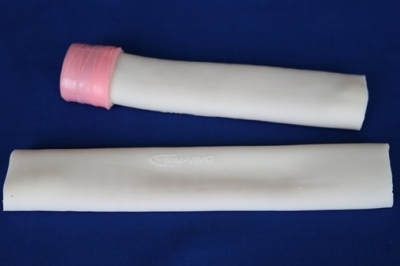 Forty 3-0 silk sutures with needles are also included with half of them colored white to simulate Vicryl which is commonly used for the inner layer. If you have seen or used our simulated bowel, you certainly know that it is truly fantastic! Composed of three layers including firm, flexible cloth in the middle, it not only looks real but it handles suture just like the real thing. Recently, we had the opportunity to trial our Sim*Bowel learning system with the surgical residents from the Department of Surgery at the University of Vermont Medical Center. Six stations were set up containing two training modules side-by-side: one utilized pig intestine from the local slaughterhouse and the other was a Sim*Bowel module. The residents practiced an end-to-end anastomosis on both. At the end of the exercise, an assessment survey was completed by all participants. Nearly across the board, the Sim*Bowel experience was rated 5/5 which compared favorably or exceeded the ratings of the real intestine!! Comments included: “realistic”, “very lifelike”, “easy to use”, and “a great learning experience.” Anecdotally, many of the participants and instructors inquired about the price. When we said that the whole learning system would cost less than $50, nobody believed us. One instructor asked how we could afford to stay in business at this price. The answer is simple: one of the early goals of Sim*Vivo was to provide surgical simulation modules and supplies that were so affordable that each learner would be able to purchase the learning materials for their own use in or out of the simulation laboratory. We understand that the key to acquiring competent skills is practice … practice … practice and our products encourage this even after the teaching session is complete. Attached are some pictures from the UVM bowel training session. As you can see, this was educational, productive, … and fun!! Please see our web site for further information about this and our other simulation learning systems and supplies.